According to Dr. Annelle Primm, who has worked in the area of health disparities as it relates to African Americans for decades, co-founding a treatment program which provided in-home mental health treatment to patients, a PTSD diagnosis is more common in women than men, and that disparity holds true in African-American communities. 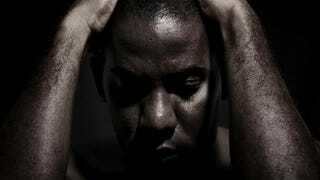 Black men are less likely to receive a diagnosis of PTSD. The idea that coming forward for help is seen as a weakness, Primm says, is directly related to stereotypes that people hold of individuals with mental illness—that mental illness is laziness or a character flaw rather than a disease. Dr. William Lawson, chair of the department of Howard University’s Department of Psychiatry and Behavioral Sciences, says that black veterans are more likely to experience PTSD because they are often on the front lines of battle and more likely to have experienced previous traumatic experiences. Lawson remembers a patient who kept seeing body parts floating in the air. The patient had been in a foxhole during Vietnam and a grenade fell down the hole and blew up everyone in it. He kept seeing visions of that happening. Lawson says in many cases, like this patient, he found that doctors were misdiagnosing them as schizophrenic. PTSD, an anxiety disorder characterized by symptoms of flashbacks, nightmares, hypervigilance, being hyperreactive, and withdrawal, among other symptoms, is a diagnosis where veterans are given financial relief, whereas schizophrenia isn’t a diagnosis eligible for financial aid. Outside the veterans’ system of support, there isn’t a lot of support for black men and PTSD. Thomas Mellman, a professor of psychiatry and director of the Center for Clinical and Translational Research and Stress/Sleep Studies Program at Howard’s College of Medicine, has been working on studies on black veterans and sleep disorders, but also of 18- to 35-year-olds and sleep disorders in inner-city areas in Washington, D.C., where violence and trauma have occurred. Mellman has found that talk therapy can be a healthy form of treatment and that having people write about their traumatic experiences went a long way toward relieving distress. Dr. Tanya Alim, a Washington, D.C.-based psychiatrist, found during her studies that 50 percent of patients who had been exposed to trauma developed PTSD, but only 17 percent had been recognized and entered into treatment. Armstead, who has been advocating for black veterans to elected officials for over 20 years, has found that a variety of treatment works to alleviate PTSD for African-American men who are skeptical about traditional treatment modalities. But first, it’s important for black men to seek treatment.